Ankara: Turkish President Recep Tayyip Erdogan escalated his campaign to seize the nation’s largest listed lender, Turkiye Is Bankasi A.S., calling for a parliamentary vote on the takeover. With the financial sector reeling from mounting bad debts and the onset of a recession, a political melee over Isbank before municipal elections in March risks further rattling investors. Isbank shares tumbled almost 7 per cent, their steepest decline since a market rout in August 2018. “Inevitably financial markets will be nervous to this kind of ‘interventionist’ news in the run up to the local elections at the end of March,” said Nigel Rendell, a London-based senior analyst at Medley Global Advisors. It’s not the first time Erdogan has mingled a desire to expand his power over the financial system with an election campaign. Before last year’s presidential vote, he pledged to take greater control of monetary policy, helping trigger a crisis in the lira. While the opposition CHP party doesn’t get any dividends from its 28 per cent stake in Isbank, Erdogan accuses it of “exploiting” the memory Mustafa Kemal Ataturk, the father of modern Turkey. Ataturk bequeathed Isbank shares to the party he created in his will. The president contends that what once belonged to the nation’s founder shouldn’t be owned by a political faction. The lender has said in the past that any effort to nationalise it would amount to a financial crime. The CHP has resisted Erdogan’s demands to give up its stake in the lender and its four seats on the board. “The transfer that has been in government’s agenda for some time was last mentioned by the President in late October and has been somewhat forgotten since then,’ said Can Oksun, a trader at Istanbul-based Global Securities. Erdogan’s adviser, Yigit Bulut, first began floating the idea of nationalising Isbank in 2015, saying at the time that Turkey needed to “swiftly” make the bank “a state bank by pushing through the necessary legislation.” Isbank said in a statement then that seizing a public company could constitute a financial crime. Neither the bank nor the CHP party commented today. In his latest remarks, Erdogan indicated he had the support not just of his own group but of the Nationalist Movement Party, or MHP, his ally in parliament to soon force a vote on the takeover. Isbank’s pension fund holds 40 per cent of the lender, while about 70 per cent of the 32 per cent free float is held by foreign investors. 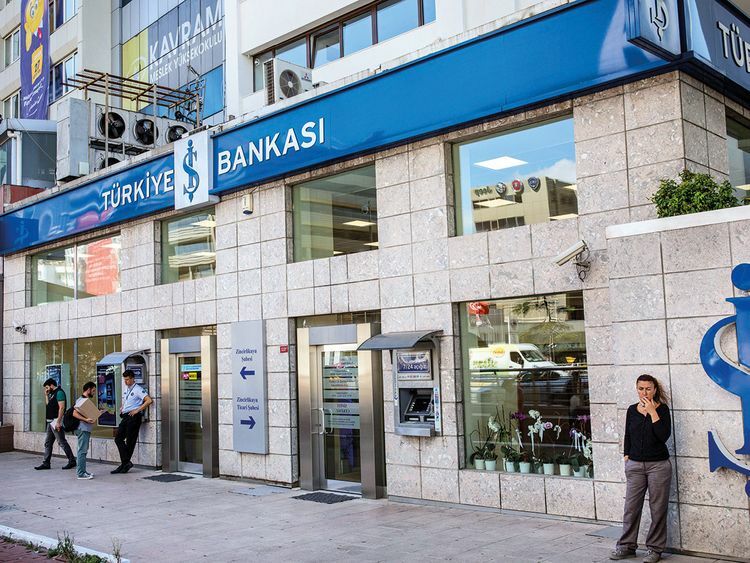 The takeover comments come as Turkish banks struggle with debt restructuring demands from companies that were hammered by the lira’s 28 per cent drop against the dollar last year. That hurt firms’ ability to repay foreign-currency loans. Slowing economic growth and high costs of borrowings have hit asset quality, slowing loan growth and hitting profits in the banking sector. Isbank’s net income was 4.6 billion liras ($885 million) in the first nine months of last year, almost flat from a year earlier, while its profit fell 19 per cent in the third quarter compared with the second quarter. The bank’s non-performing loan ratio was 3.4 per cent at the end of September, compared with the sector’s average of 3.2 per cent. The lender sees bad loans rising to around 6 per cent this year.